A question we are asked often from client’s looking to renovate their cabinetry is “should I go with particle board or plywood construction?” If you’ve researched a little about both materials, you may find that opinions are pretty torn. So first, let’s compare the two! Plywood is made of of layers of thin “slices” of wood bound together to create a thick panel, totalling 1/2-3/4″ in thickness. 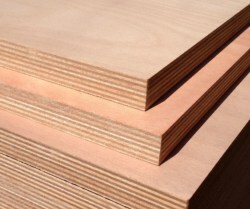 Plywood is often made of lightweight woods, meaning the resulting product is noticeably lighter than more compact materials like particle board, which is something most installers will love. Because of its layered construction, it’s less susceptible to swelling when coming in contact with water. It is said that plywood is overall more durable of a material over time and tends to hold screws better than particle board; this is the biggest reason why most people want to upgrade to this material. It can, however, expand and contract with extreme changes in temperature and is a little more difficult to sculpt details/intricacy into than particle board or MDF material. Plywood can also have upgrades of its own within cabinetry lines, like our cabinetry line Crystal which offers the ability to choose a sustainble/green and even lower VOC options within their box construction. However, all these amenities do come with a larger price tag, being about 10-15% more than particle board/MDF construction. 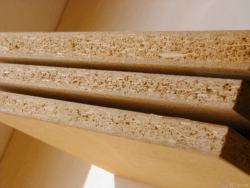 Particle board is a heavier product, made of shredded wood composite, often leftovers of scrap wood, bound together to create a dense and fiberous board. It’s available in similar thickness to plywood, but because of it’s composition, is heavier than plywood. Particle board is more susceptible to water damage over time than plywood, but water damage is often not an issue unless the cabinetry is constantly in standing water from a leak. Particle board is said to not hold screws as well over time as plywood, but this is more determined by quality of material than the material itself. The compact fibers make it less susceptible to damage from weather change and will not expand and contract the way plywood may. Particle board is great for detailed cuts or curved edges. Particle board’s most appealing factor is its low cost, saving you quite a bit of money over plywood. 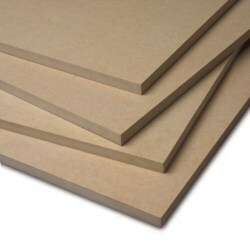 MDF (medium density fiber) board is the denser version of particle board. It’s made relatively the same way but the actual particles in the board are ground down to a sand-like texture and bound together, making it even heavier than particle board. It’s characteristic are very similar to standard particle board, but can be a slightly more durable option. Some cabinetry lines at big box stores will market their particle board as MDF material, so be sure to determine if this is the case or if it’s really medium density fiber board.